Chat with your friends or send them text messages up to two miles away with the Chat Now communicator. Talk one-on-one with your best friend or chat with everyone in your chat zone at the same time. You can send and save text messages, even add symbols to personalize them. Take pics of your pals and save them to your communicator. . . there's a digital camera built in. Animate their photos and save them to your personal buddy list. There are no fees, no bills and no minutes to keep track of. Saved buddy photos, ten different ring tones . . . access them with the easy-to-use controls, flip-out keypad and the push-to-talk button. Turn it on, flip it out, and get talking. 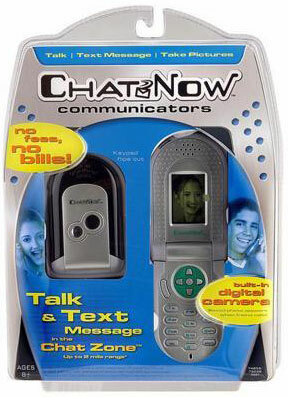 ChatNow Communicator with flip-out keypad lets you chat or text your friends from up to two miles away. Built-in digital camera. Save pics of your friends to your personal buddy list. This 2-way radio has a range of under two miles under typical conditions.